Andries died in an accident, when a beam fell on him and pressed him to death. If he's not the earliest burial recorded in the graveyard that surrounds Kingston's Old Dutch Reformed Church, he's one of the earliest. His stone is no longer in the graveyard: It has been taken upstairs into the church history room for safekeeping and display. It should last much longer there than outside, exposed to the elements. There is a rather large DeWitt plot near the entrance to the church offices, with probably more than a dozen DeWitts buried there, but most of the stones have literally lost their faces, so we'll never know which is which. The church keeps some old records of who was buried there, but nobody knows which grave is which unless there's a marker. 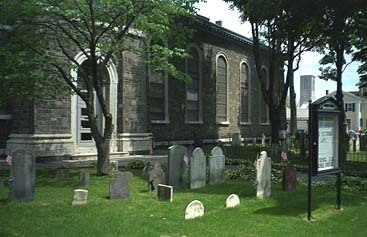 When the church was expanded, a number of graves were covered by the new building. Names of the people in those graves are inscribed on the wall inside the church itself. DeWitt graves outside the Old Dutch Reformed Church at Kingston, New York. 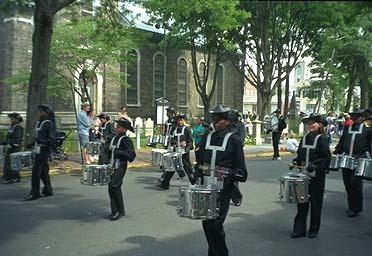 Kingston's Memorial Day 1998 parade passes right by the graves of DeWitts of yore, some of the original Dutch founders of the colony, more than a few decorated with the flags that say they served their country in war.